The transfer portal and a wave of immediate eligibility waivers have dominated the college football offseason. So what does it all mean? Chris Petersen shook his head three times, in search of an effective answer. 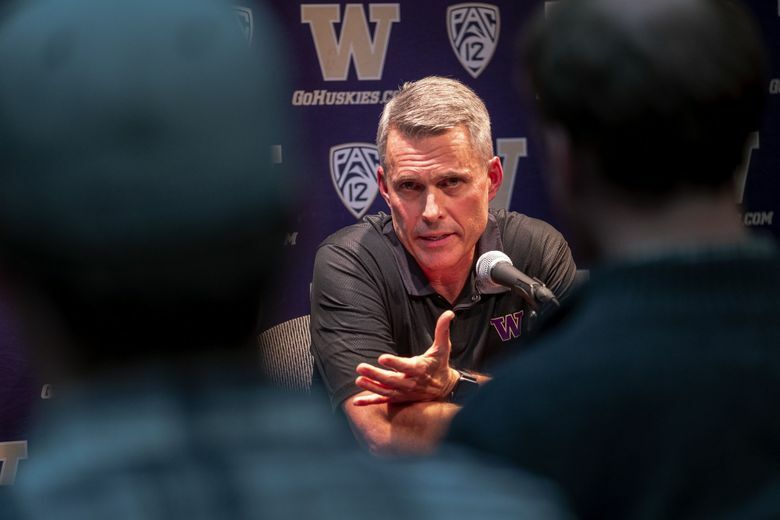 Washington’s sixth-year head coach was sitting in front of a microphone and a line of cameras, flanked by a purple backdrop, dutifully answering a round of questions on national signing day in early February. For nearly 22 minutes, he discussed the program’s recruiting strategy, as well as his latest class of signees and where the Huskies go from here. But suddenly, he was stumped. OK, so let’s try our best to provide said information. Here’s a primer on the transfer portal, immediate eligibility waivers and what it all means for the current climate of college football. What the heck is the transfer portal? Though the name seems more fit for a science fiction thriller, the transfer portal is actually a national database available to FBS and FCS programs to monitor which players are available on the transfer market. To enter the portal — which went into effect on Oct. 15 of last year — a player must only alert his current school of his intention to transfer. This marks a departure from the previous policy, which required the student-athlete to ask permission of his current program before being allowed to contact another school. Once a player informs his program of his intention to transfer, said program has two business days to enter that player’s name in the transfer portal. All schools with access to the database are then free to contact the player and offer a scholarship. And, if the numbers are any indication, it has had the desired effect. From Oct. 15 through early February, 1,454 Division I football players entered the portal, according to the NCAA. One of those was Eastern Washington quarterback Gage Gubrud, who won an appeal for a sixth year of eligibility and transferred to nearby Washington State, where he’s expected to win the Cougars’ starting job this fall. The hope, for both Gubrud and head coach Mike Leach, is that the two-time finalist for the Walter Payton Award — given annually to the best offensive player in the FCS — will replicate the success of 2018 standout Gardner Minshew, who made a graduate transfer from East Carolina and promptly finished fifth in the Heisman voting. However, it’s worth noting that an undergraduate who enters the transfer portal is still required to sit for a full season before becoming eligible to participate at their next institution. Is free agency coming to college football? Last April, the NCAA’s Division I Council approved a rule modification for student-athletes seeking immediate eligibility following a transfer. In the past, a player would only be granted immediate eligibility if he could demonstrate a “specific, extraordinary circumstance” that necessitated the transfer or “egregious behavior” by his previous institution. So, what exactly does that mean? What qualifies as “mitigating circumstances”? “The answer to your question, which I’ve been asked before, is, who knows?” said Arkansas-based lawyer Thomas Mars, who has represented multiple players with immediate eligibility waivers. “What does mitigating circumstances mean to me? It means whatever the discretion of the NCAA staff thinks it should mean. In the simplest possible terms, it means — so far, at least — that more players are being granted immediate eligibility than ever before. Between the time of the rule modification in April 2018 and early February, 64 Division I college football players had submitted immediate eligibility waivers, and 51 of them — 79.7 percent — had been approved, according to the NCAA. Some of the more prominent cases centered around quarterbacks Shea Patterson (who transferred from Ole Miss to Michigan) and Justin Fields (who transferred from Georgia to Ohio State), both of whom were represented by Mars and granted immediate eligibility. Washington quarterback Jacob Eason — who transferred from Georgia to UW in Feb. 2018, prior to the rule modification — did not have an immediate eligibility waiver submitted on his behalf. As a result, the former five-star Lake Stevens product redshirted last season and is expected to grab the starting reins this fall. Quarterback Tate Martell — who notably verbally committed to UW and head coach Steve Sarkisian at age 14, before ultimately signing with Ohio State — is the latest in an increasingly long line of immediate eligibility decisions. The 5-foot-11 signal caller opted in January to transfer to Miami, where his waiver is currently pending. So, with that said, are we approaching an age of rampant free agency in college football? It may be trending in that direction, and that’s what coaching staffs are afraid of. Maybe so, but Chris Petersen certainly isn’t one of them. Then again, the Huskies’ head coach hasn’t been bitten by college football’s transfer trend. Penn State, for comparison’s sake, had 11 — yes, ELEVEN — players enter the transfer portal last winter. The NCAA calls that improved flexibility for the student-athlete. Penn State head coach James Franklin would call it something else. “That’s probably the biggest challenge for administration, as well as coaches: How do you ever know who’s actually on your roster and who’s not?” Franklin told ESPN last month. “A lot of coaches have said as soon as you enter the transfer portal, they’re going to take you off scholarship, but that’s another problem with this. They’ve left it kind of gray that each school and each coach can handle it differently. These are the issues college football coaches — Petersen and Leach included — are suddenly tasked with tackling. In a constantly evolving transfer climate, the power is shifting from programs to players. For the time being, at least, there seem to be more questions than answers. And not just on national signing day.